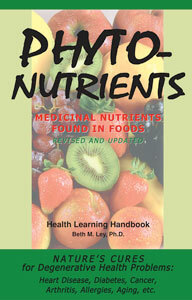 Foods found in nature provide us with much more than vitamins and minerals. Science has discovered numerous phytonutrients found in the foods we eat every day which have specific health-promoting properties.Some prevent us from cancer, others from heart disease, cataracts, arthritis, diabetes, and even aging. These special “plant-derived” compounds can even prevent problems such as constipation, allergies, asthma, obesity, the common cold, and much more. Find out which foods to eat to help you fight off disease and illness!